This is a visualization of the crystalline structure of TiO2, showing the various planes. Image: MIPT. Using numerical modelling, researchers from Russia, the US and China have discovered previously unknown features of rutile titanium dioxide (TiO2) that could reveal why it is such an effective photocatalyst. The modelling calculations were performed on the supercomputer Rurik at the Moscow Institute of Physics and Technology (MIPT) in Russia. A paper detailing the results appears in Physical Chemistry Chemical Physics. TiO2 is naturally found in the form of rutile and other crystalline minerals, and when exposed to light can break down a range of compounds, including water molecules and hazardous organic contaminants. This photocatalytic activity depends on the arrangement of oxygen and titanium atoms on the TiO2 surface, which is why it’s important to understand which forms the surface of rutile can take. Atoms on the surface of a crystal are arranged in planes; by convention, these planes are described by three digits that reflect the intersection between the plane and each of the three crystallographic axes. Compared to atoms in the bulk of a crystal, atoms on the surface have fewer neighbors and more dangling bonds, which means they have to regroup – the atomic structure undergoes a process of reconstruction. From previous experiments, the scientists knew that on the surface of the 011 plane of rutile TiO2, the most common reconstruction is (2×1). This means that the distance between atoms in one direction is doubled and in the other direction remains unchanged. 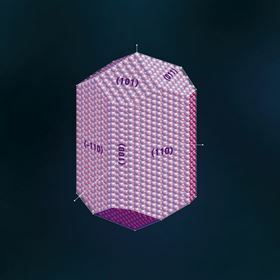 When the surface of R-TiO2(011) is irradiated with a beam of accelerated electrons, the top oxygen atoms break away to leave atom-thick rows of empty spaces. These rows, known as oxygen vacancies, can increase the chemical reactivity of the surface. Once the atoms on the surface have subsequently undergone reconstruction, only certain arrangements are stable. The stability of these arrangements can be predicted by a value known as the surface energy – this is the energy of the bonds between atoms on the surface in a unit of area. Using computer modelling based on the fundamental laws of quantum mechanics, the scientists were able to construct a surface phase diagram, mapping the dependence of surface energy on composition. They could then use this diagram to determine which arrangements are stable. In addition, the researchers calculated the surface stress – the force acting on atoms on the surface – for the unreconstructed surface of rutile R-TiO2(011). These calculations led the scientists to conclude that R-TiO2(011) and the previously predicted titanyl-TiO2 and B(001)-TiO2 reconstructions are caused by surface stress and must be stable. To confirm this conclusion, the researchers modeled the surface of rutile R-TiO2(011) and then compared this model with images produced by a scanning tunneling microscope (STM). They hope that their calculations will not only expand existing knowledge of the atomic structure of the surface of TiO2, but will also provide a better understanding of its photocatalytic properties. "The richness of surface phases is due to a combination of thermodynamic conditions and the effect of surface stress," said Qinggao Wang from MIPT, who is corresponding author of the paper. "Most importantly, we have emphasized the role of kinetics and analyzed the metastability of surface structures, which has significantly broadened our current understanding."